Harlequin Macaws are large parrots that have become popular among bird lovers for their lovely plumage and friendly personalities. The Harlequin is a hybrid that has been produced through selective breeding and is not found in the wild. They are very intelligent, long-lived birds that make excellent companions for the right owner. The Harlequin Macaw is a hybrid resulting from the mating of a Blue and Gold Macaw (Ara ararauna) and a Green-winged Macaw (Ara chloroptera). According to animal-world.com, the males have the dominant gene affecting the appearance of the offspring. Macaws are originally found the countries that are in Central and South America. These are full-sized macaws and can reach a weight of 1.9-3.3 pounds (0.86-1.50 kg) and a length of 34 inches (86 cm). There are no distinguishing features to differentiate males from females so DNA testing is the only reliable way to determine your bird’s gender. What’s the Personality of the Harlequin Macaw? Harlequin Macaws have bright coloration that is based on the colors of their father. 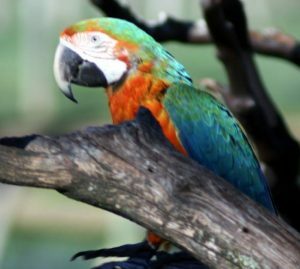 Green-winged fathers produce offspring with an orange breast whereas Blue and Gold Macaw fathers will have babies that have reddish-orange breasts. Bright blue, red and green make up the majority of this bird’s plumage. They have large and powerful beaks. How Does A Harlequin Macaw Act? The Harlequin Macaw takes on the personality traits of the two species that produce this hybrid bird. It combines the docile nature of the Green-winged Macaw and the clownish personality of the Blue and Gold Macaw, making it a fun loving and lovable pet bird. They are typically rather laid-back and are not overly energetic. Even with proper socialization, they can become one-person birds, and can also exhibit typical macaw behavior such as being cranky and particularly loud at times. They get along very well with other macaws if you are planning on introducing a companion bird. As with all macaws, they do require a good deal of interaction with their human family members. Expect to interact with your bird for at least an hour a day to keep it well socialized and avoid behavioral problems. Despite their friendly disposition, their large and powerful beaks make these birds unsuitable for small children. These extremely social birds will welcome the opportunity to become involved with you in as many ways as possible. Harlequins are very smart and can be taught to perform some tricks. As with most parrots, positive reinforcement used in training will produce the best results. Below is a video of a Harlequin that sings and then requests a treat for its efforts! What’s The Best Way To Look After A Harlequin Macaw? 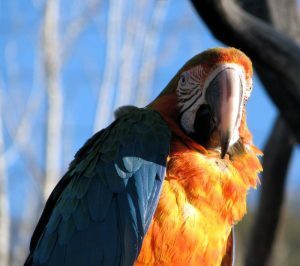 The proper temperature for your Harlequin Macaw is around 75°F (25°C) according to Lafeber.com, and they should be kept in a draft-free environment. These large and powerful parrots need a roomy cage made out of strong materials. At a minimum, your cage should measure 5x5x8 feet (152x152x243 cm) with a bar spacing of at least 1 inch (2.54 cm). Bars need to be solidly constructed so your bird cannot damage the cage and in the process hurt itself – more details about macaw cages can be found in our full guide here. Play stands and bird trees are recommended so your parrot can spend ample time out of its cage each day to help it remain physically and emotionally balanced. Harlequin Macaws are not picky eaters and enjoy a wide variety of foods. Their base diet should consist of high-quality pellets, fruits, vegetables, seeds and spray millet which is a favorite treat. They can also enjoy pasta and other foods that humans consume, but take care to avoid chocolate and other potentially bird-toxic products. These macaws love to bathe and you can get a shower perch and share the experience with your parrot. Misting them with a spray bottle is another option which they seem to enjoy. Macaws molt some feathers during the course of the year and have one major molt yearly where they replace quite a few feathers. At this time you should offer your bird more bathing opportunities and it may become a bit cranky. Their nails will need to be filed down periodically if they become overgrown. Macaws reach sexual maturity at around 4 years of age. They breed around every 2 years, and the breeding season is usually in the first half of the year. Further hybridization is brought about by breeding these birds with other species of macaws. The hen will lay 3-4 white to brownish colored eggs in a clutch. To keep your bird mentally stimulated it needs plenty of toys to keep it occupied. This includes chewing toys which it will destroy, but that are very important to its well-being. What’s the Lifespan of A Harlequin Macaw? A Harlequin Macaw that is cared for properly can live more than 50 years. They are relatively hardy birds that can be prone to feather plucking if not kept mentally stimulated. They can also be susceptible to Psittacosis, kidney disease, and infections. Proper diet can minimize the risk of disease in your parrot. 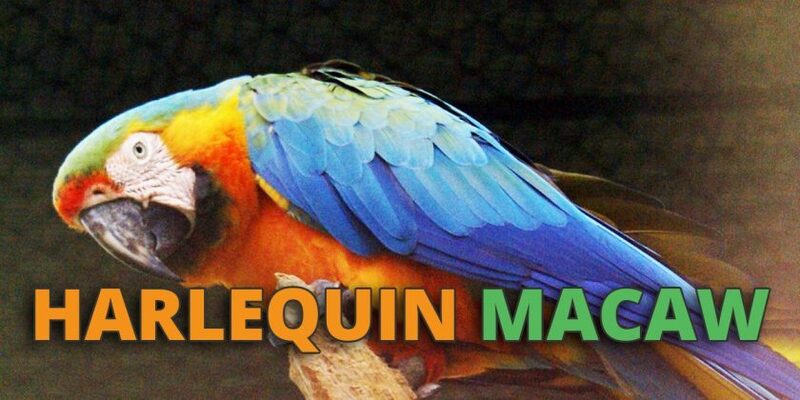 What Are The Prices Of A Harlequin Macaw? A Harlequin Macaw will cost you between $1500 and $3500, based on the coloration and age of the bird. They can often be obtained at parrot rescues. The cost of owning such a large and long-lived bird can be substantial. A large cage, lots of food, and plenty of replacement toys are going to be part of your budget for the next several decades, so be prepared. Should You Get A Harlequin Macaw? A Harlequin Macaw can make a wonderful companion parrot for the right human. That person needs to be prepared to give it a lot of attention and spend a substantial amount of money on its upkeep for a long time. Think it over carefully, for it is not a step to be taken lightly. If you fit the bill, a Harlequin Macaw can become a treasured avian family member.